FlowSurf is meant to help you jump though web pages with a single click, and this is why some computer users choose to download it from flowsurf.net. The so-called next generation search engine is a suspicious browser extension which can be installed onto Internet Explorer, Google Chrome and Mozilla Firefox web browsers. Once installed, the program can access data on all websites you visit and even track your browsing history. This information is meant to help the developers of the application to present more interesting advertisements. It is notable that in most cases they are presented as regular search results, which is extremely suspicious. 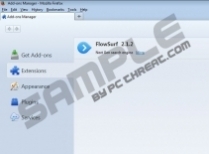 Continue reading to learn exactly why you should remove FlowSurf from the operating system. It has been discovered that FlowSurf may replace regular online advertisements on the search engines you may be using. For example, if the default search provider of your web browser is Google Search, the few advertisement-supported results which you may be introduced to will be replaced by a number of imperceptible ads. Unfortunately, these look almost identical to the regular search results, and this is meant to increase the number of clicks. Needless to say, this is a deception, and so there is a great chance that the presented offers are unreliable and cannot be trusted. We certainly do recommend that you ignore suspicious installers, purchase offers, prize giveaways and other suggestions. If FlowSurf is running on the computer, there is a great chance that other advertisement supported applications exist on the operating system as well. In some cases you may discover the Conduit Search Protect, Awesomehp hijacker, Bubbledock, and other undesirable programs. It is most likely that these will be activated onto the computer if you install unreliable bundled software. If this is the case, it is possible that you are not familiar with FlowSurf and you do not trust it running on the browsers. Our malware researchers recommend that you get rid of the suspicious browser extension. Are you experienced with the removal of undesirable applications? Do you have absolutely no experience? Regardless of the situation, you should be able to delete FlowSurf without much trouble. Firstly you should follow the manual removal guides below. Afterwards, you should employ automatic malware removal software to delete the remaining threats and adware. Keep the installed software running to ensure reliable Windows protection against all kinds of malware in the future. Simultaneously tap Alt+F and select Settings. Click Extensions to open a new menu in a new tab. Now click the recycle bin next to the unwanted plugin. Simultaneously tap Alt+T and select Manager Add-ons. Simultaneously tap Ctrl+Shift+A to open Add-ons Manager. Move down the menu on the left and click Extensions. Quick & tested solution for FlowSurf removal.